It's time to DANCE! Shake it! Shake it like a polaroid picture! OH, wait.... maybe that's not what they meant. Oh, well. I'm going to continue on with my personal dance party nonetheless. (Clap your hands if you feel like happiness is the truth!.....) There, now you have some music in your head to dance to, so you can join me. HA! BUT, this is not all for naught. (HA! I love using not and naught in the same sentence. *sigh* Words make me happy. K. Moving on.) The Simon Says Stamp Wednesday Challenge this week is a SHAKER challenge! That's right, we want you to SHAKE IT! The Design Team is using Simon Says Stamp exclusives. You don't have to use them to participate, but if you have them we would love to see you rock them! Soooo.... it may or may not have been my idea to do shaker boxes for a challenge and it may or may not have caused someone in our group to groan loudly. Which was much more amusing BEFORE I had my complete and utter shaker disaster. HAHAHA! For reals, though, they take a little thought, but they are SO much fun! You can do a shaker box or a confetti pocket! Anything that shakes. Make it happen, folks! I also grabbed a page from the amazing Laura Bassen's book and added a bit of tissue paper and string beneath my shaker. I think she was the first person I saw doing the whole tissue paper thing and I am pretty sure that's brilliant. For reals, though. AND...one lucky participant in this week's challenge will win a $50 Gift Voucher to the Simon Says Stamp Store! WHAT?! Woot! Woot! 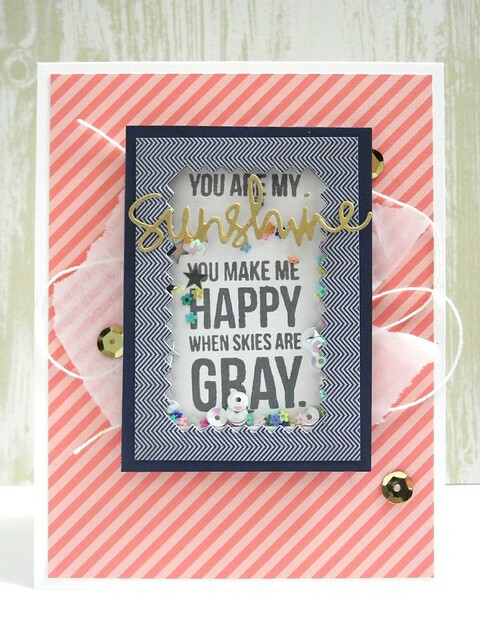 You can find the supplies I used for my card in the links below. This is amazing, Jennifer. The gold sequins are pretty and I love the fun sequins. So fun, Jennifer - love how it all works together! Love the card and the sentiments is one of my faves! Fabulous shaker, Jennifer! I love all the different layers and shapes, especially that gold die cut word! Super fun shaker Jennifer! 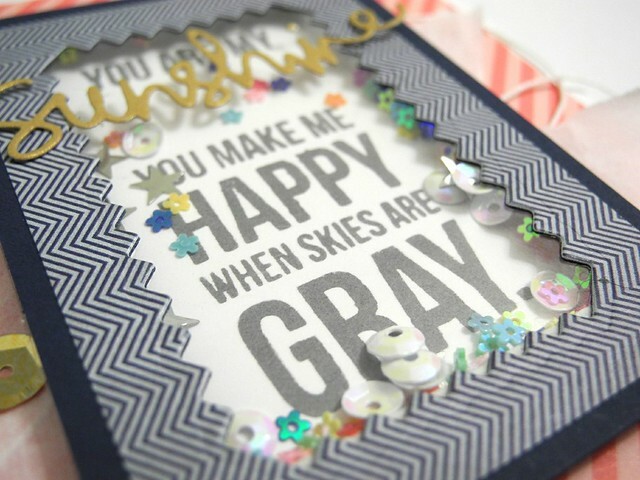 I really like the gray sentiment. A fabulous card Jennifer, a great design and colours - I love the pretty sequins and especially the sunshine and the brilliant sentiment!! So fun, I love all the different sequins you used too! beautiful card, Jennifer, the tissue paper is a lovely idea! Awesome shaker card!!! Love it! Fabulous card Jennifer!! Such a great design! Love it!! FAB shaker card Jennifer - LOVE it!!! This sentiment never gets old for me :) Love the way you die cut sunshine in gold and put it over top the shaker! hi Jingle! sweet shaker, the sentiment is the best...soooo fun! hope you have a fabby weekend! Oh what a fabulous shaker card. Because I'm Happy....you really did get that song in my head! Awesome shaker and I'm so glad you may or may not have suggested this theme. I LOVE shaker cards and they are totally worth the time and frustration. You've done Laura proud with the tissue and stamping inside the shaker is a brilliant idea. Now I've got to 'clap along' and make my own one!! Super fun shaker card, Jen!! Love it! thanks for the songs in my head! love the shaker idea, but I'm not exactly good at them. Guess I'd better give it another shot! wow great shaker.. love this..